What’s your history with your weight and body image? I was overweight as a preteen. I was teased for being overweight and later developed an eating disorder as a result. I battled with a combination of restricting and bulimia, as well over exercising. I was hospitalized in my teens for depression and because of how fast I lost weight. My vitals were really low and I was fainting all of the time. I went to extremes to avoid food and lose weight. When I did eat, I would “punish” myself with purging or exercise everything I had eaten off. I was starving my body. When I found out I was pregnant, I suddenly ate what I wanted, when I wanted. I gained and gained weight while I was pregnant and told myself I'd lose it once I had him. After I had my son I would lose some weight and then gain it back in an endless cycle. I was binging all of the time and I barely left my couch. I had high blood pressure and got out of breath doing everyday tasks. It got to the point where I avoided cameras and mirrors because I was so unhappy with my body. I was around 215ish when I got married. After our wedding I had two early miscarriages and was extremely depressed. I vowed to myself to change my lifestyle. For “real” this time. No more gimmicks or fad diets. I had tried SO many over the years. I started eating healthier, lost a smidge of weight (7lb or so) and got pregnant with my second son. I got up to 245lb while pregnant. After giving birth I lost some weight, but within 6 months postpartum was back at 230lb (June 2015). I remember crying on both sides of the spectrum, thinking I was destined to have an unhealthy relationship with food for the rest of my life. I felt hopeless, like I would always either eat way too little or eat way too much, indefinitely. Starving or binging. That all or nothing mentality went for exercise too. I was either over exercising or barely leaving my couch. I felt I would always be trapped in a state of imbalance. I remember feeling like even trying to find balance was a lost cause, because I would never achieve it. I have always struggled with an all or nothing view of eating. That has been the absolute biggest change with this lifestyle revamp. Not starving myself, and not endlessly binging. Just. Being. HEALTHY! 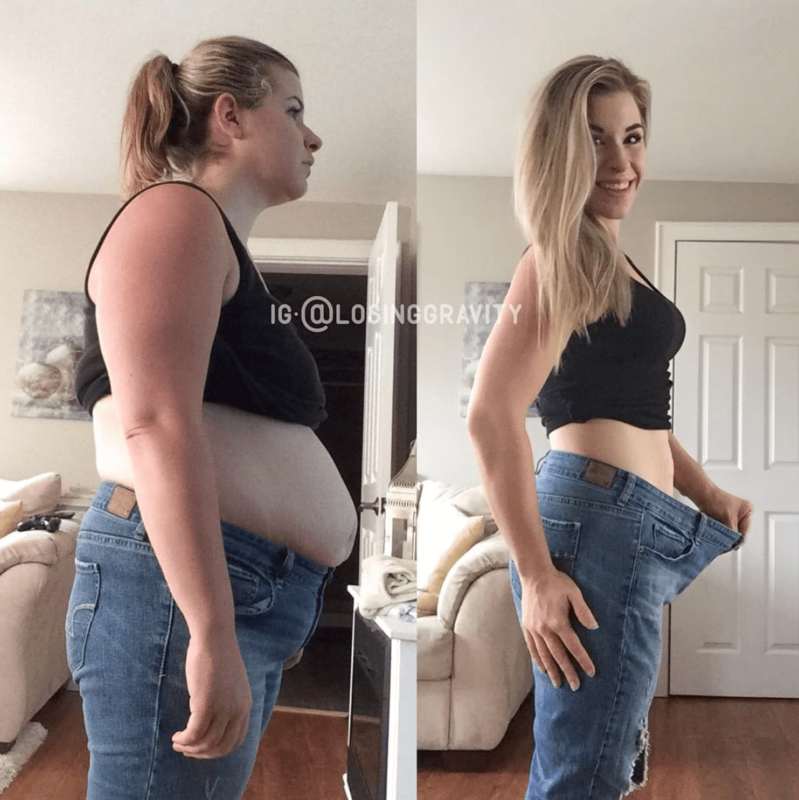 When and what prompted you to begin your weight loss journey? I was tired of crying. I was tired of being lonely. I never wanted to make plans with friends, I had become antisocial. I wanted to be a better mom. I began my weight loss journey in June 2015. I had gotten to the point of crying at my own reflection. I was so unhappy with my body, and got exhausted doing everyday tasks. I had no desire to even really leave my house or be social because I was so unhappy with myself. I am a mom of two kids and wanted to change my lifestyle not only for myself, but for them as well. My journey really began when I stopped seeking the next “quick fix” to lose weight and realized it was going to take time. Work. Dedication. Commitment. It began when I realized a lifestyle change was what I needed. I had tried sooo many gimmicks before I made this realization. What I really needed was healthy food and exercise, not a short term attempt at a solution. I calorie counted for quite awhile to make sure I wasn't eating too much or too little. I just made a commitment to myself to follow-through on my goals. I was so focused and so determined. Some days that I was exhausted, but I kept pushing. There were days that I exercised at 11:30pm after my kids were asleep. I would take rest days, but they were planned and not because I was too tired or couldn’t find time to get my workout in. After I had lost about 30 pounds, I got a Fitbit charge and I found it motivating to keep active. There were days that I “missed out” on certain meals that everyone around me was enjoying. I skipped treats and desserts. I didn't have cheat meals. In the past I would lose a bit of weight, then a cheat meal would turn into a few cheat days, which would spiral until I gained back the weight I had lost. For so long, I feared that happening again and found it easier to just focus on eating healthy and avoiding temptation. What are some of your favorite healthy meals? Spicy Kung Pao Meatballs, Firecracker Salmon, Skinny Chicken Enchiladas, and Eggroll in a Bowl. You can find the recipes I use my Pinterest. When I'm short on time, things like protein waffles, salads, stir fry, and avocado toast with varying toppings. My relationship with exercise is so much healthier! I exercise to feel good and not to punish myself as I did in my teens. I go for lots of walks with my kids. I have a fitbit which is motivating to reach my step goal. Earlier this year I joined a local gym and am loving incorporating weights! I find life can be super unpredictable as a mom, and just tend to take things day by day. In the beginning, I just focused on being active and getting my steps in, getting my heart rate up, and sweating. There are so many ways to exercise without a gym membership. I spent so much time just walking with my kids. The resistance of pushing a big stroller with a kid in it was a great workout for me. I ran up and down stairs or hills while they played. I did jumping jacks, lunges, or even just jogging in place while watching TV. I would do laps around my car while my son snoozed inside. I did the 30 day shred. I danced. I walked, walked, walked, and walked some more. I didn’t ever have a daily “plan” except for when I was doing the shred. I just kept moving! How stay active when you are stressed or short on time? Confidence! Finding balance – that's what this journey has been about for me. I have more energy. I have more desire to be active and in turn I feel healthier, mentally and physically. I've lost the all or nothing mentality when it comes to food and exercise. I'm just living a healthy, balanced lifestyle, day by day. Being able to walk into a store and know they will have my size is huge for me. When I started this journey I wore a size XXL/2X/20 so being able to shop at any store is such an amazing feeling. How have your relationships with people changed since losing 100 pounds? I started actually following through when making plans with friends. I used to make plans and then cancel all of the time. I love being social now because I don't have to fight with my insecurities. I enjoy making time to hang out with friends and I want to interact with people now. Before I used to feel like I was hiding from the world. I have lost my “all or nothing” mindset surrounding food. I focus on eating healthy foods, watching my portion sizes, and indulging occasionally. I have learned how to have balance and that is priceless. I have started enjoying treats or a “cheat meal” once a week. I usually stick to one night “off” a week but here and there the whole weekend ends up a big free for all. It always scares me to be honest, because I fear losing the control I've gained and that I'll slip back into these old habits. Since I've incorporated these meals and treats back into my life, I have found I crave them more, if I’m being honest. I think the difference is that I’ve truly learned balance and I know that one cheat meal won’t make you fat, just like one good meal won’t make you healthy! Do you still struggle with binge eating? I do still experience binges once in a while – I find that the most important part in overcoming binges is acknowledging the behaviour and continuing on the path of healthy eating habits. I used to binge one day, feel guilty the next, and continue on binging because I felt I had already “ruined” any progress I had made. Striving for balance. Striving for progress. Dusting myself off the next day and getting back to the healthy habits vs old ones is most important to me. As much as I try to avoid them though, they do still happen. Rarely, but they do. I get asked a lot how I keep motivated and sometimes it's easier than others. Truthfully, the motivation comes and goes. You just have to push through! There are a million and one things I want to hold onto: my health, my confidence, my future, my mental health. Before I started this journey, I would cry at my own reflection. I was so unhappy with myself and I will fight everyday to never go back to that dark place. There are also two boys that I know deserve a healthier, happier, and more energetic mom. I want to continue to set an example for my them by living a healthy lifestyle. I've taken photos along the way and documenting my progress has helped. When I'm struggling I can look back and see how far I have come. I never want anyone to think that since I lost a lot of weight, it's all effortless now. It has certainly gotten easier to keep up with this lifestyle, but it doesn't mean I don't struggle at times too! Do you have excess skin? Yes, I do. It’s mostly on my stomach, thighs and arms. Some days I embrace it, and others I have a harder time with it. People always ask ‘How did you avoid loose skin and stretch marks?' and the answer is ‘I didn't! Its all there.' High waisted bottoms have become my BFF. 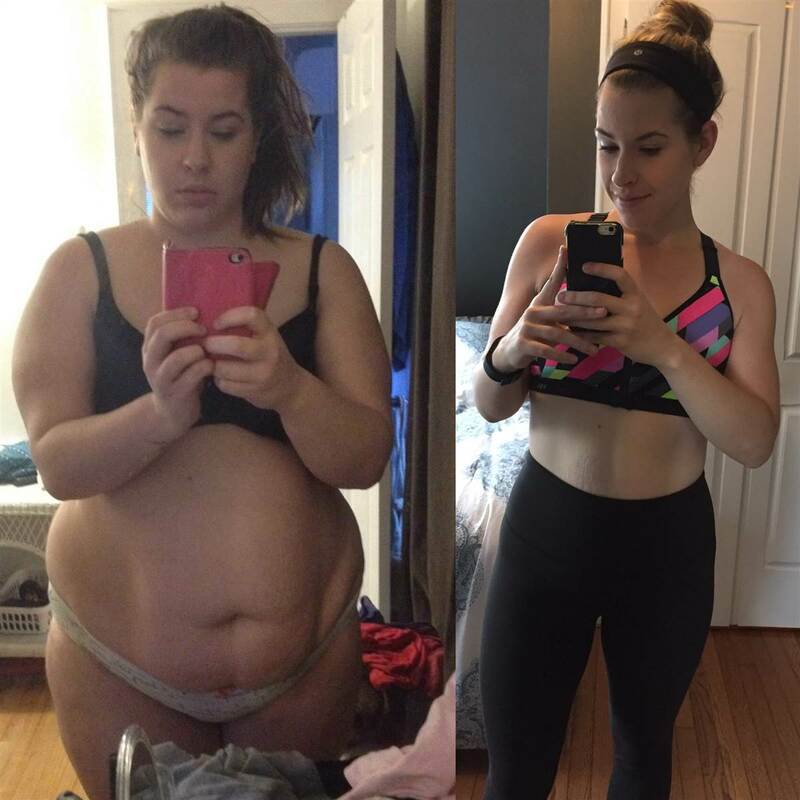 When I began this journey I felt as though I would love my body if I just lost the weight. It simply isn't that easy and I'm trying my hardest to just embrace this ‘new’ body of mine, loose skin and all. I want to keep it ‘real' to those following my journey, and excess skin is my reality. It is an insecurity of mine, and while I'm learning to love this body – loose skin and all, I refuse to let it consume me. It doesn't hold me back like the weight used to. My stomach has grown two beautiful boys and has been through a 90lb+ gain and loss (100lb+ lost from my highest weight while pregnant) I do plan to have surgery some day, but in the mean time I'm just working on self love. I am more fit than I've ever been in my entire life. I am happier and I am healthier. Do I regret losing weight? Hellllll Noooooo. NEVER. Not even a the slightest bit. Anything else you want to share with others who are trying to lose weight? I want people to know that it is 110 percent possible. I used to feel as though it wasn't. That I didn't have ‘what it takes,’ and that it was just too far out of reach. If you want to make changes, it is completely possible with healthy food and exercise. Losing weight isn't a “one size fits all” thing – find what works for you! Take pictures! I have found that documenting and comparing the changes has helped keep me motivated. Start an instagram account to keep yourself accountable. Take measurements. There are many ways to see “progress” happening, it’s not just about a number on a scale. A saying that has really helped keep me from giving up when I felt hopeless or that my goals were just so far out of reach was “Never give up on a dream just because of the time it will take to accomplish it. The time will pass anyway.” There are so many of you who truly keep me inspired everyday. Between the kind words and following of others journeys. Being part of a community has helped me so much and I can't thank you guys enough for the love! It may seem like a long road ahead, but your goals are obtainable. When you reach them, you will wonder how the time seemed to have flown by! Keep fighting! This is such a piece I needed to read! My goodness, I am looking at my life cycle on paper!! That all or nothing mentality – I finally have words for what I’ve been doing! Thank you so much for sharing and showing that it can be done.